“Fearless Girl” has weathered her fair share of controversy, but probably this small logistical change won’t drum up any more of it. On Thursday, New York City Mayor Bill de Blasio and State Street Global Advisors announced that the bronze “Fearless Girl” statue would be removed from her position facing the “Charging Bull” of Wall Street and placed instead in front of the New York Stock Exchange, due to safety and pedestrian traffic concerns. Part of the city’s calculation was that “Fearless Girl” is located in a narrow corner of Bowling Green that becomes overly congested with pedestrians. The other, somewhat related, part were concerns, prompted by the deadly truck attack in Lower Manhattan last year, that the statue might be a target, and its current location doesn’t afford it, and those in its vicinity, the requisite protection. 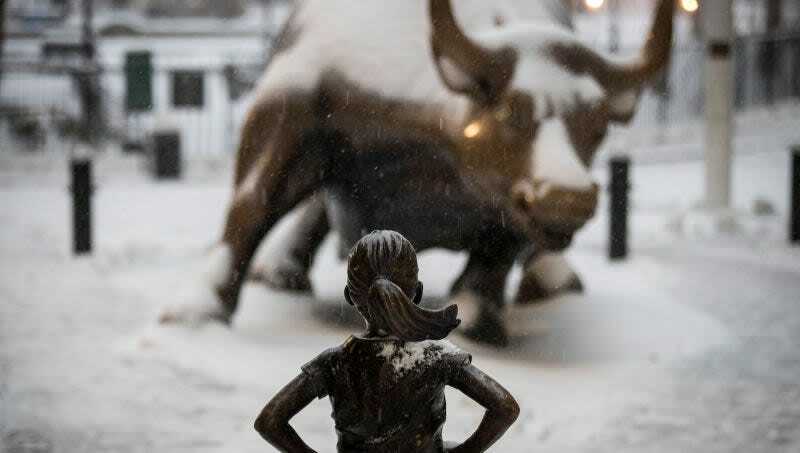 Kristan Visbal, the artist behind the statue, which was first installed near Wall Street in 2017 to honor International Women’s Day, said in a statement released by City Hall, “I am thrilled ‘Fearless Girl’ will remain in New York.” The move is expected to occur sometime before the end of the year.